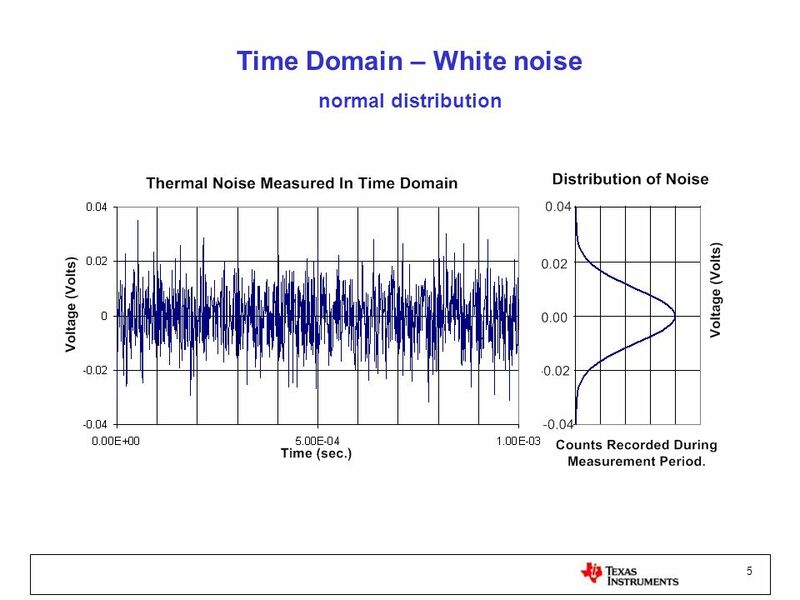 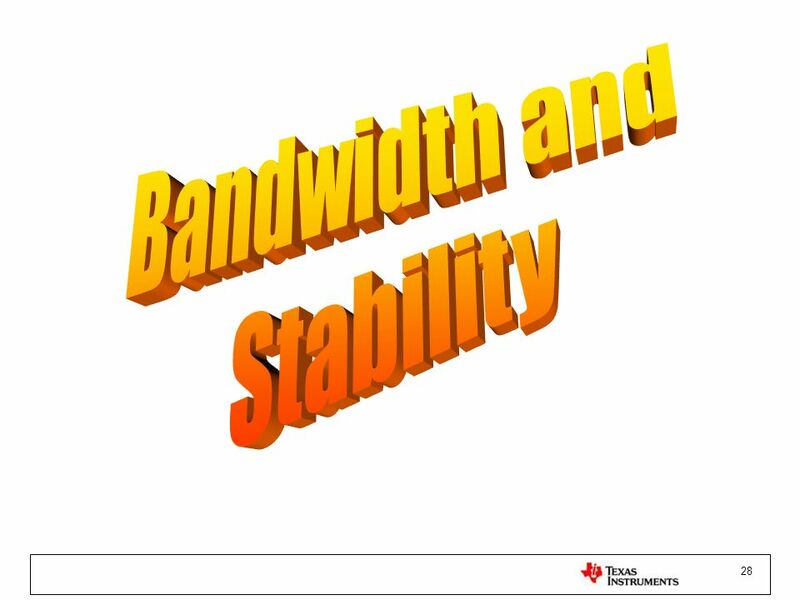 normal distribution This slide shows the time domain waveform for broadband noise. 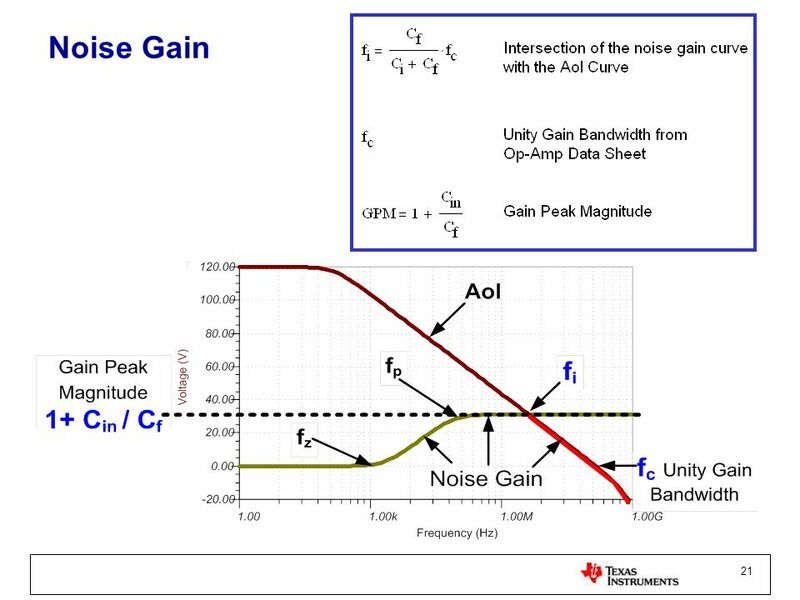 The distribution for broadband noise is also shown; note that it is Gaussian. 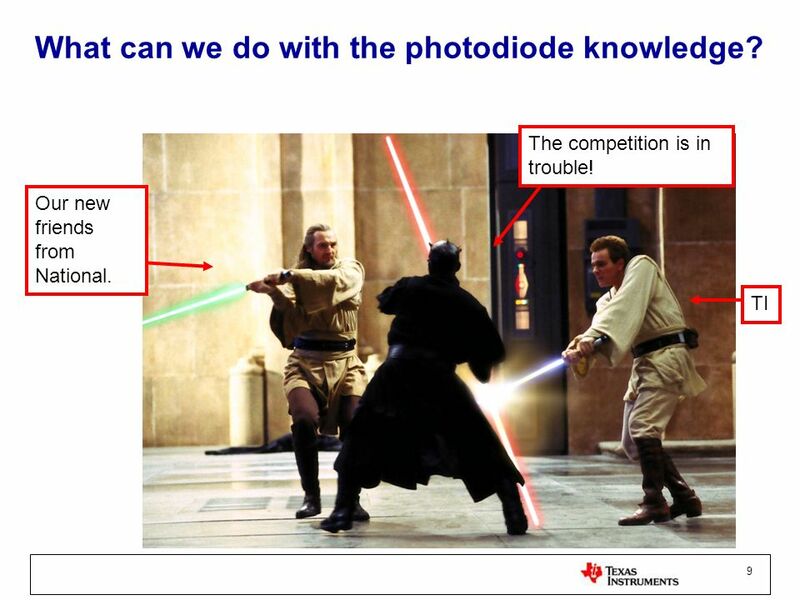 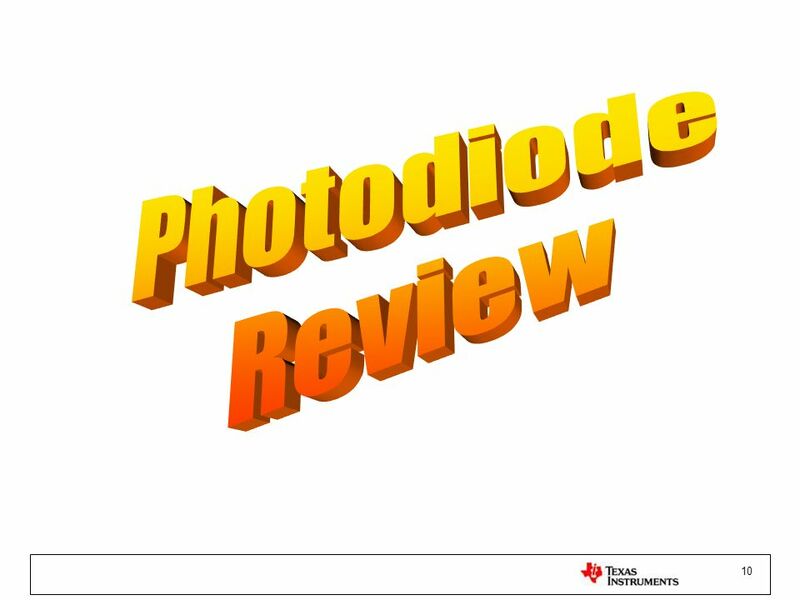 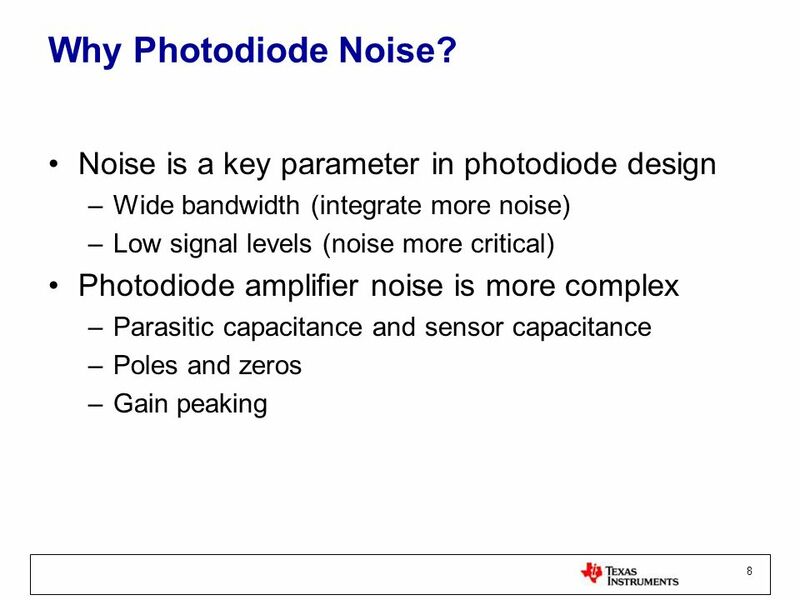 9 What can we do with the photodiode knowledge? 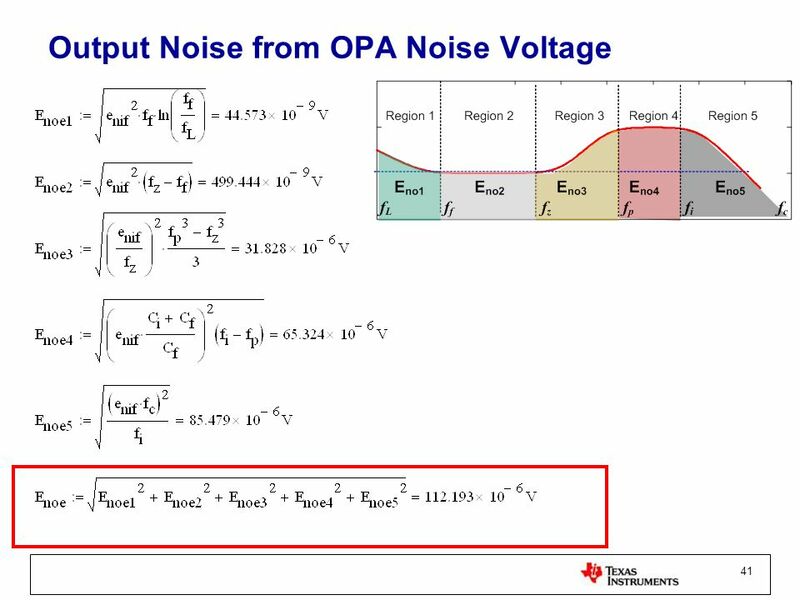 Principle of Operation: . 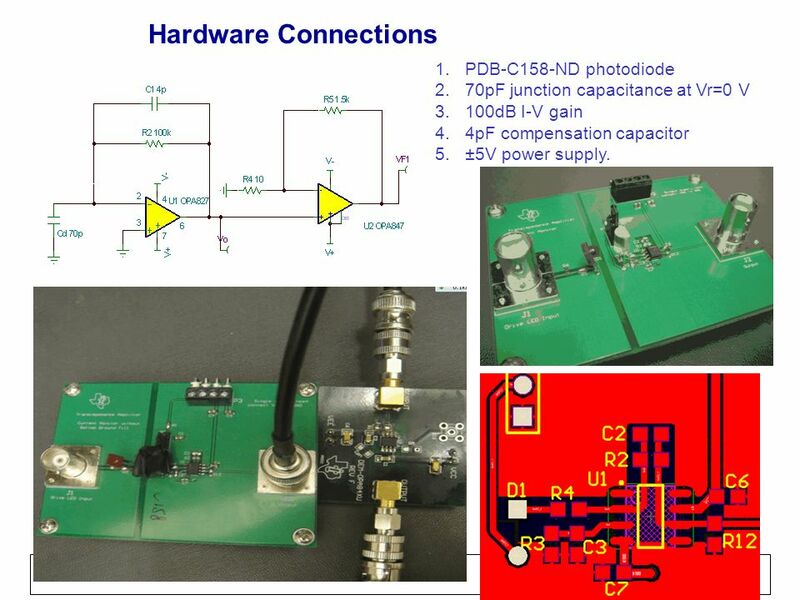 - The P-layer material at the active surface and the N material at the substrate form a PN junction which operates as a photoelectric converter. 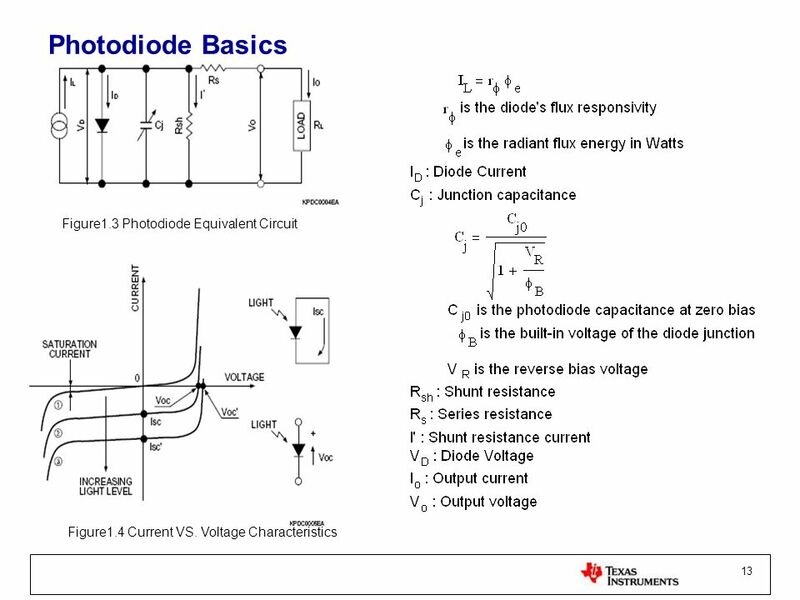 - When light strikes a photodiode, the electron within the crystal structure becomes stimulated. 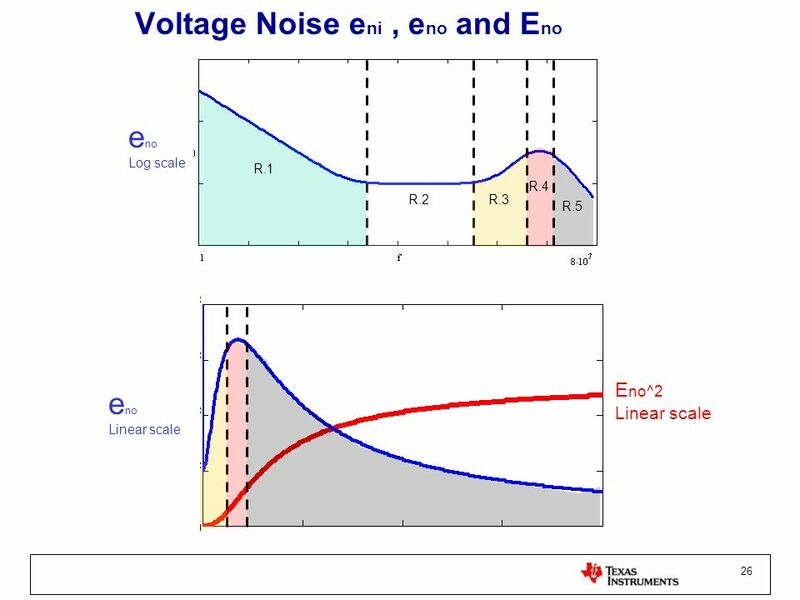 If the light energy is greater than the band gap energy Eg, the electrons are pulled up into the conduction band, leaving holes in their place in the valence band. 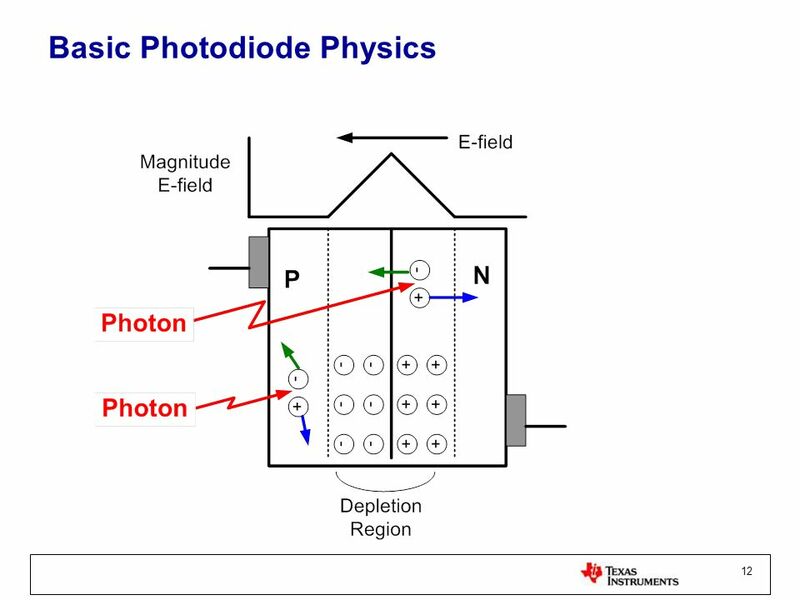 - These electron-hole pairs occur throughout the P-layer, depletion layer and N-layer materials. 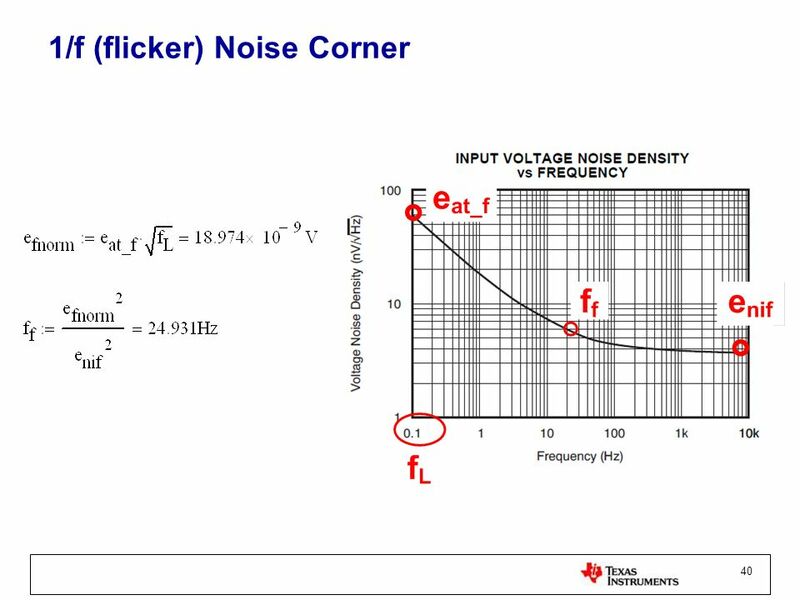 In the depletion layer the electric field accelerates these electrons toward the N-layer and the holes toward the P-layer. 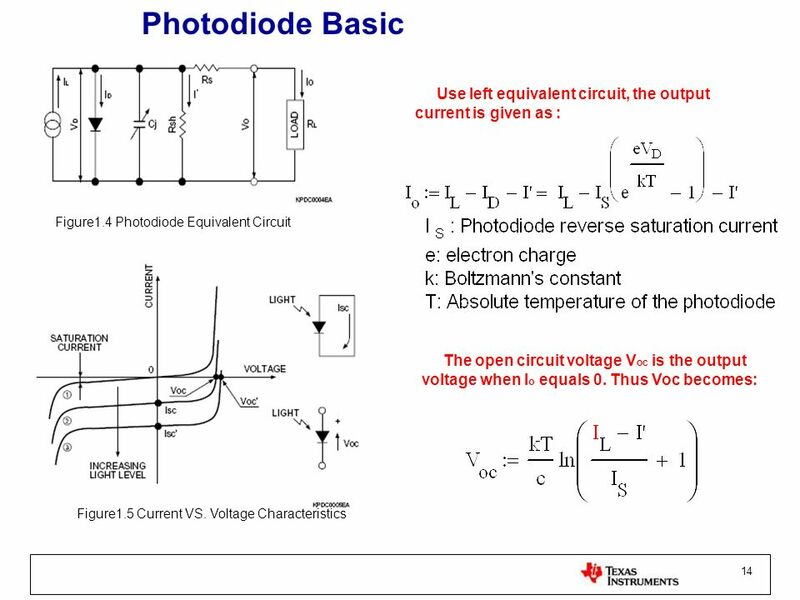 - This results in a positive charge in the P-layer and a negative charge in the N-layer. 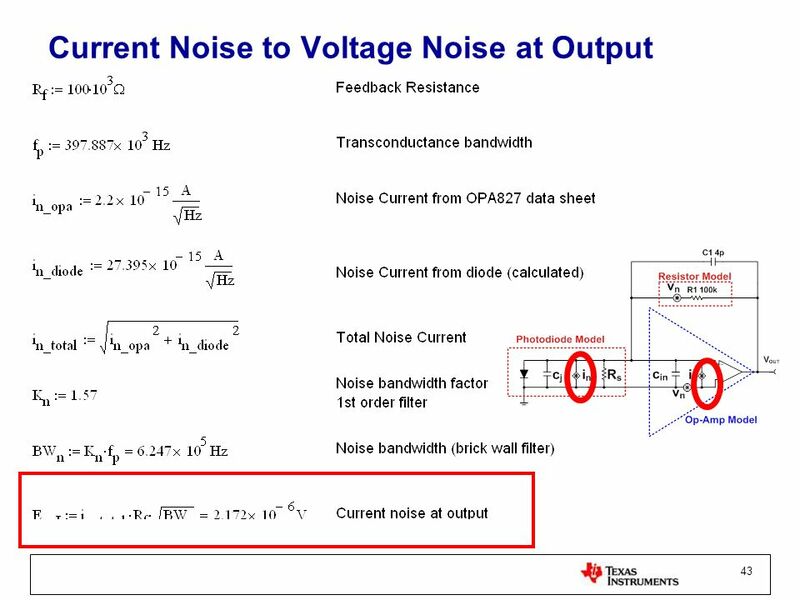 If an external circuit is connected between the P- and N-layers, electrons will flow away from the N-layer, and holes will flow away from the P-layer toward the opposite respective electrodes. 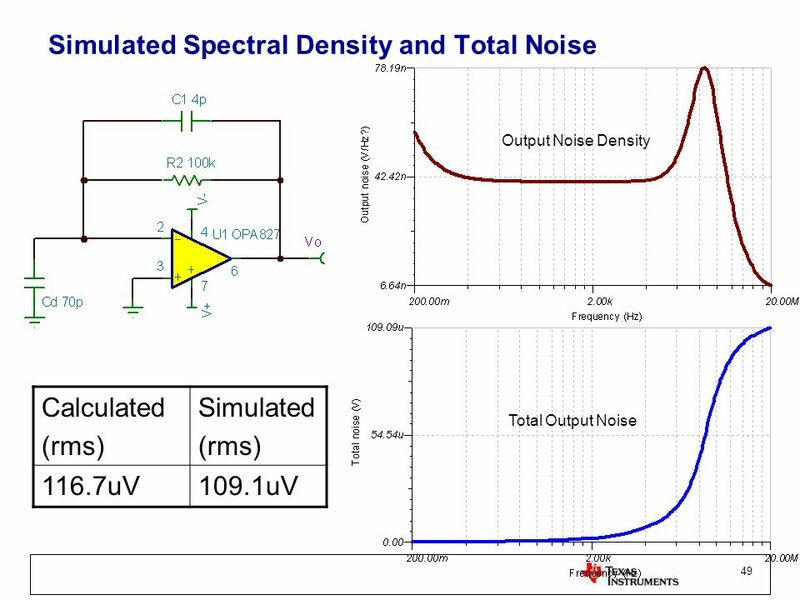 Light exciting source: 1) Use VG1 and VG2 voltage sources to simulate light power wave. 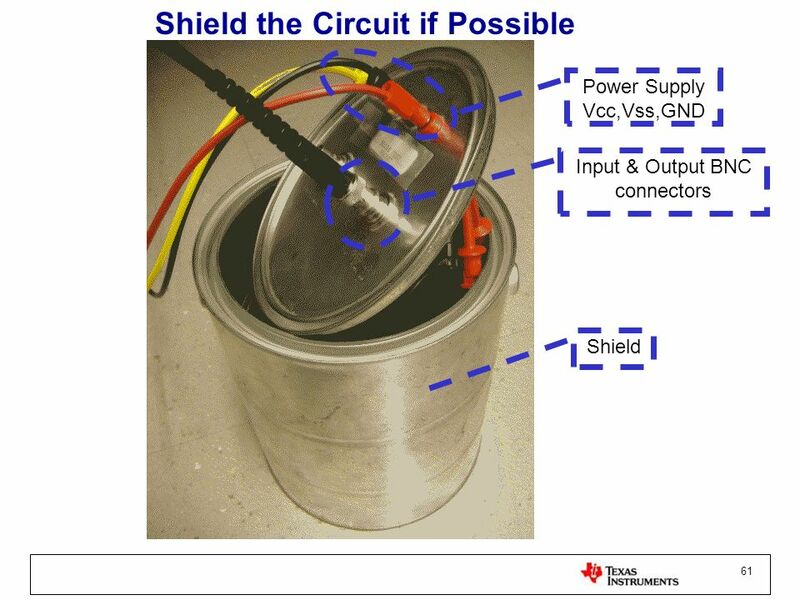 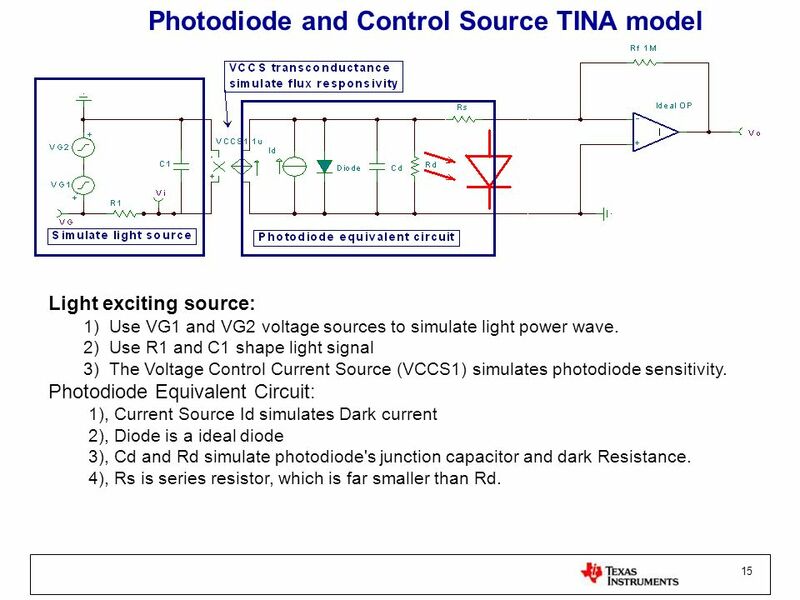 2) Use R1 and C1 shape light signal 3) The Voltage Control Current Source (VCCS1) simulates photodiode sensitivity. 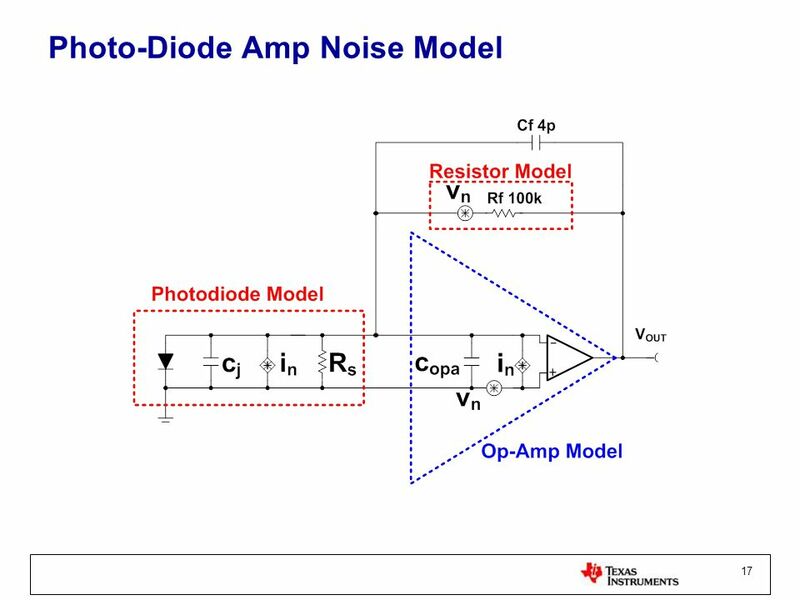 Photodiode Equivalent Circuit: 1), Current Source Id simulates Dark current 2), Diode is a ideal diode 3), Cd and Rd simulate photodiode's junction capacitor and dark Resistance. 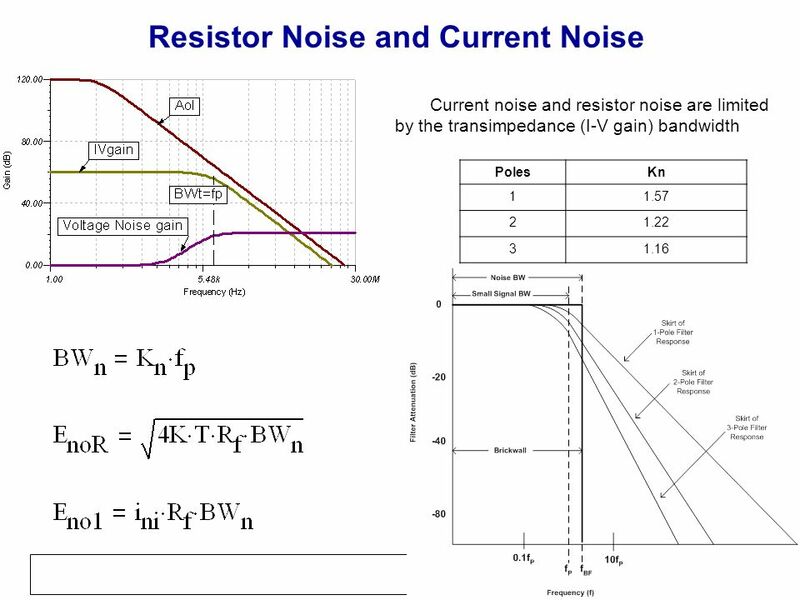 4), Rs is series resistor, which is far smaller than Rd. 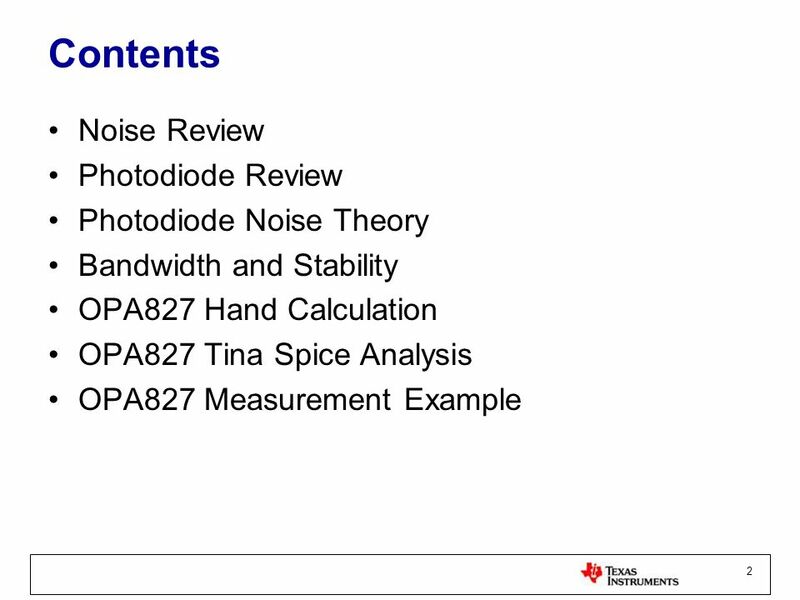 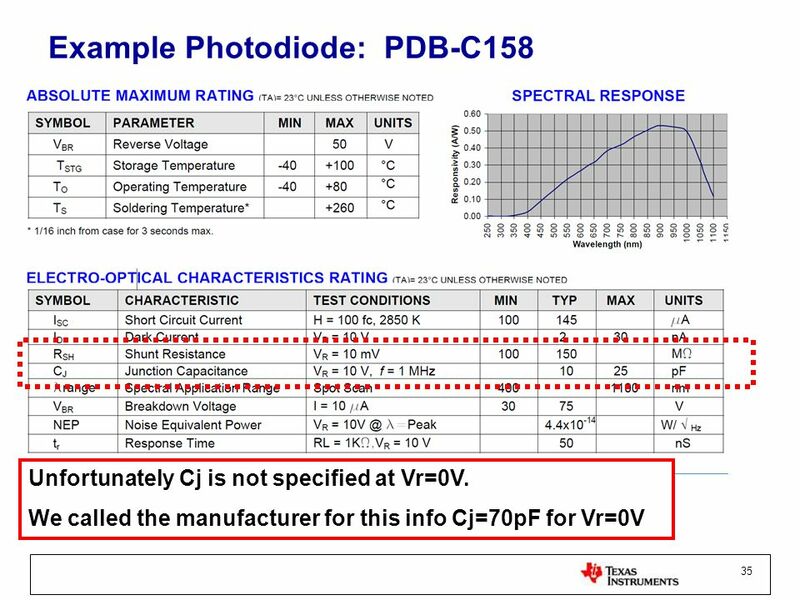 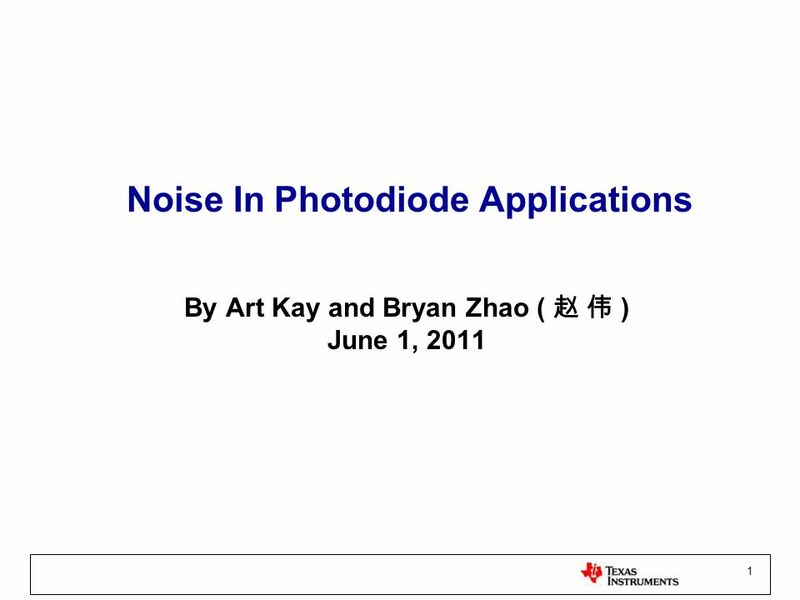 18 Photodiode noise The lower limits of light detection for photodiodes are determined by the noise characteristics of the device. 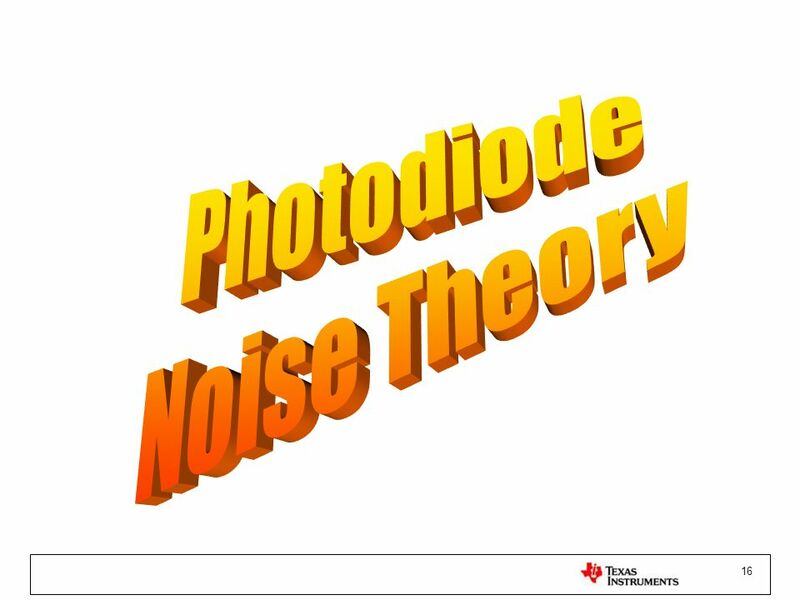 The photodiode noise in is the sum of the thermal noise (or Johnson noise) ij of a resistor which approximates the shunt resistance and the shot noise isD and isL resulting from the dark current and the photocurrent. 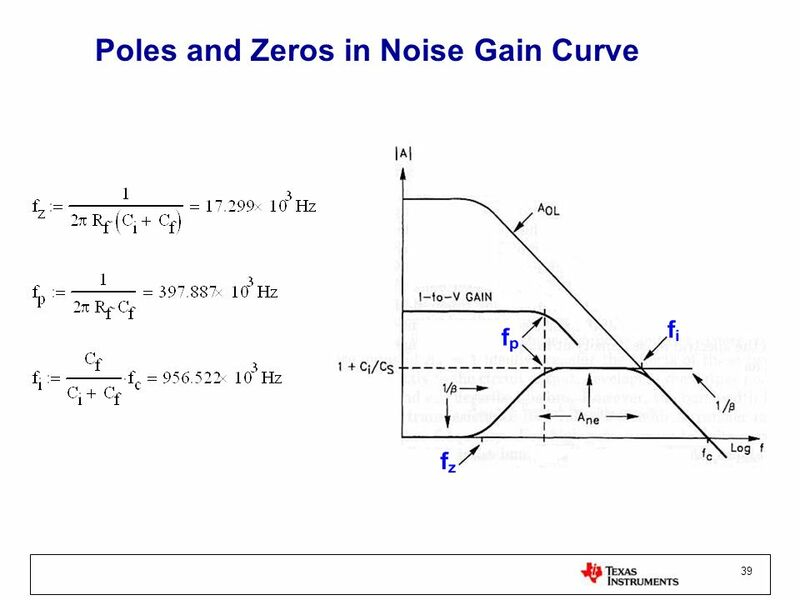 If IL >> 0.026/Rsh or IL >> ID, the shot noise becomes predominant. 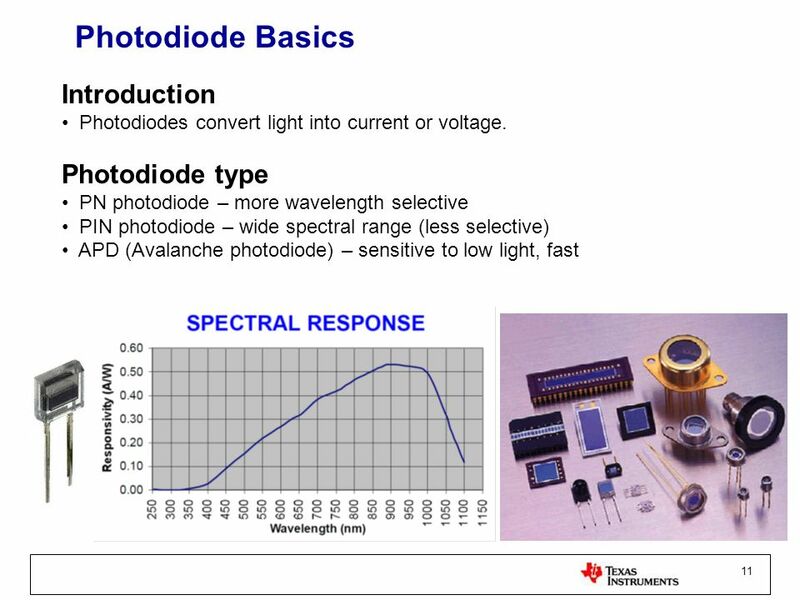 The lower limit of light detection for a photodiode is usually expressed as the intensity of incident light required to generate a current equal to the noise current . 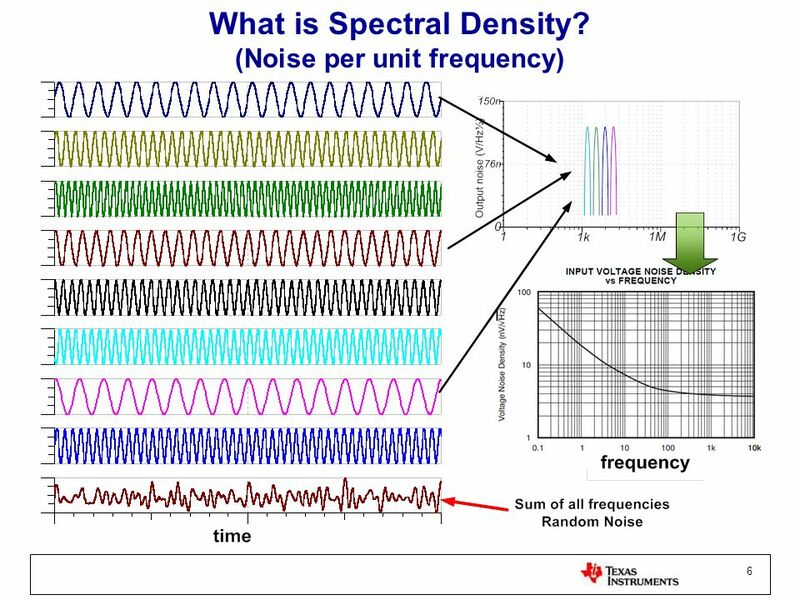 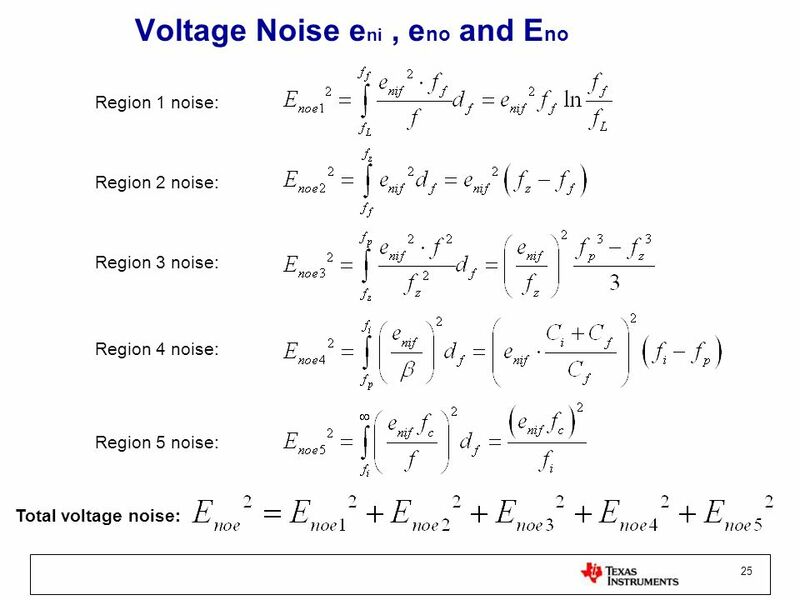 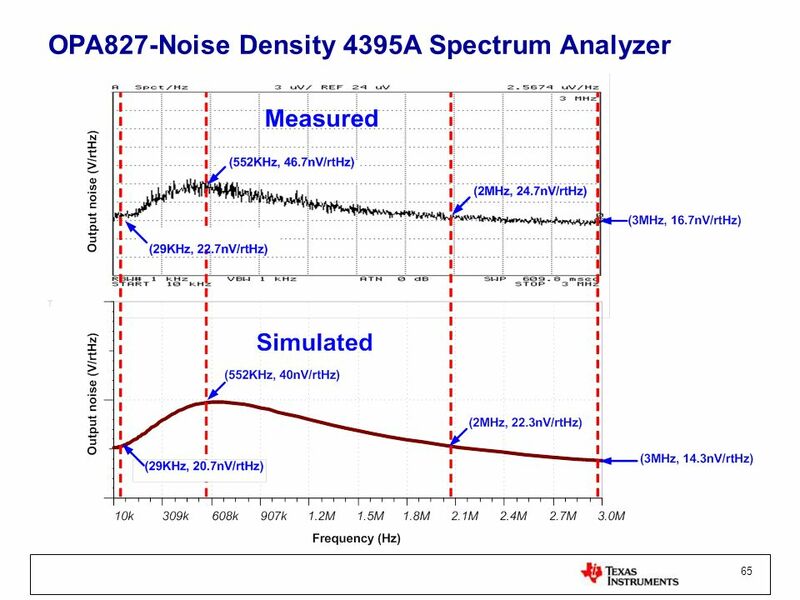 Essentially this is the noise equivalent power (NEP). 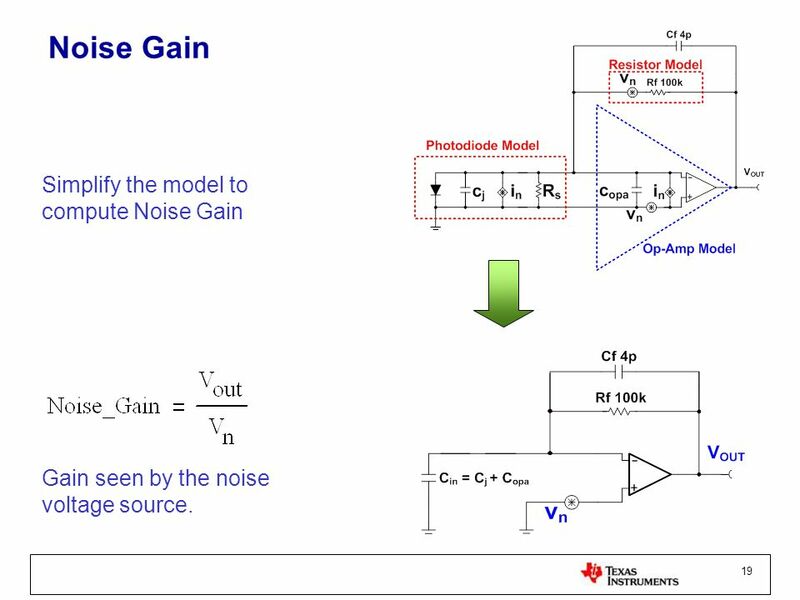 Gain seen by the noise voltage source. 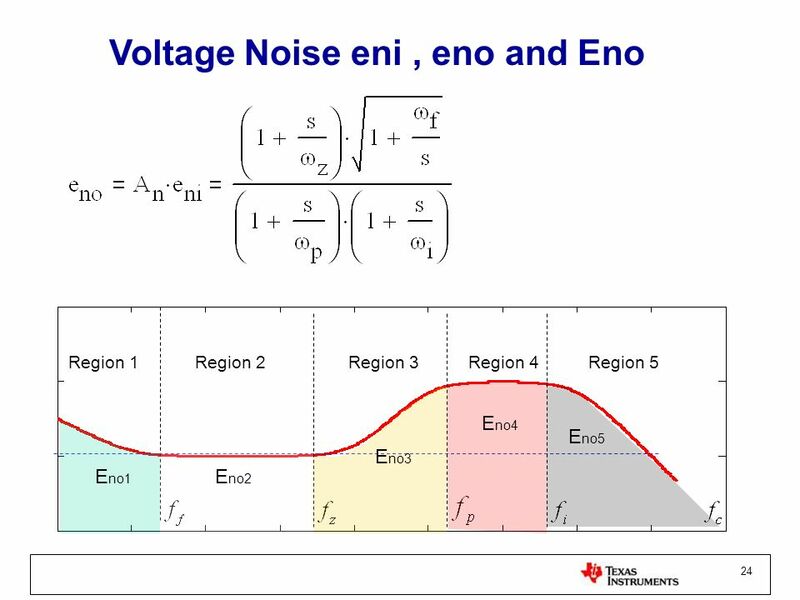 Log scale R.1 R.4 R.2 R.3 R.5 Eno^2 Linear scale eno Linear scale Two left figures obviously present: although 1/f noise density is very large in noise density, but noise gain and bandwidth make region (3,4,5) contribute to output noise (Eno) most. 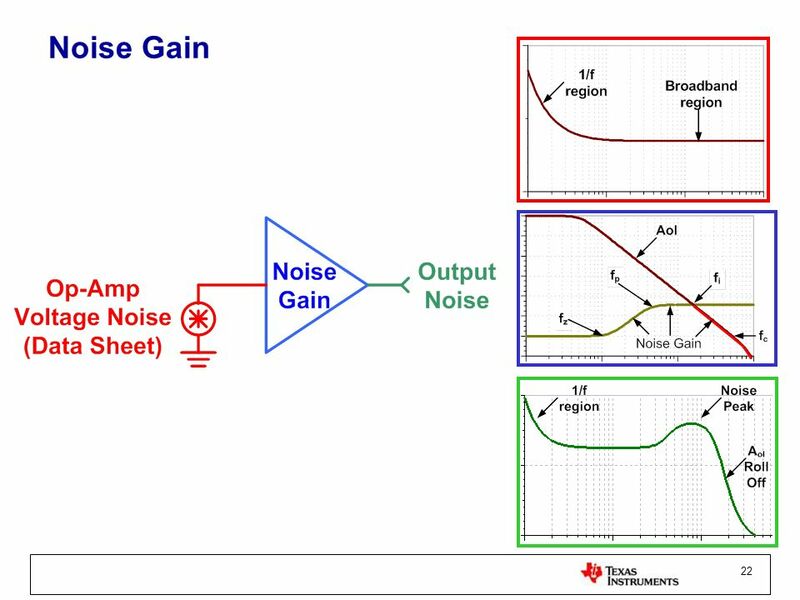 Noise gain effect region is controlled by Ci,Cf,Rf,fc. 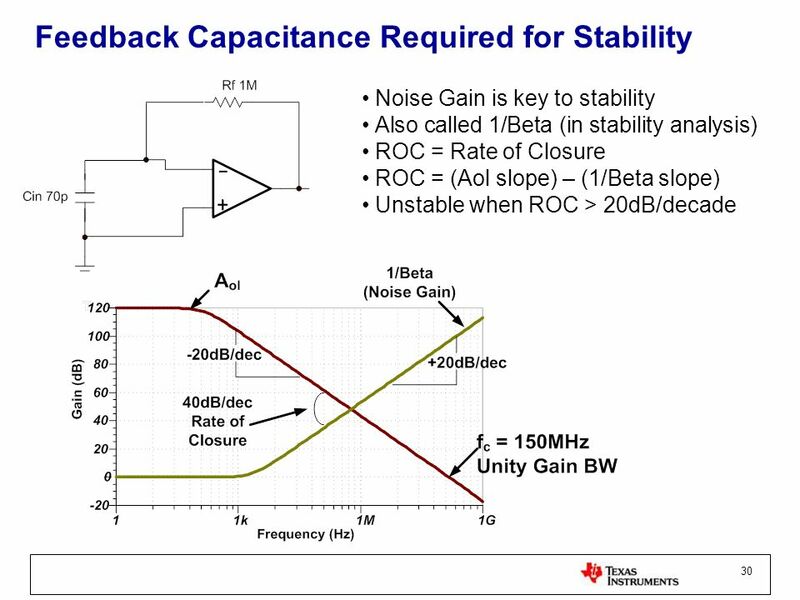 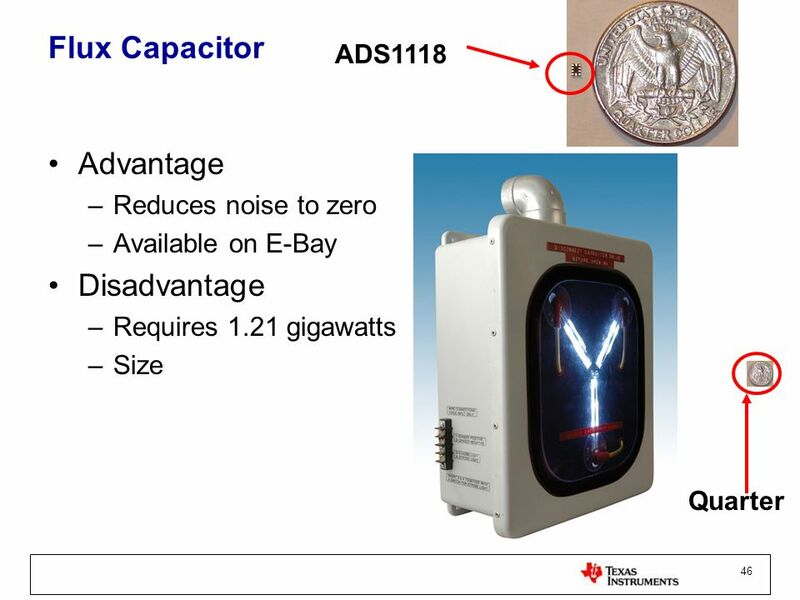 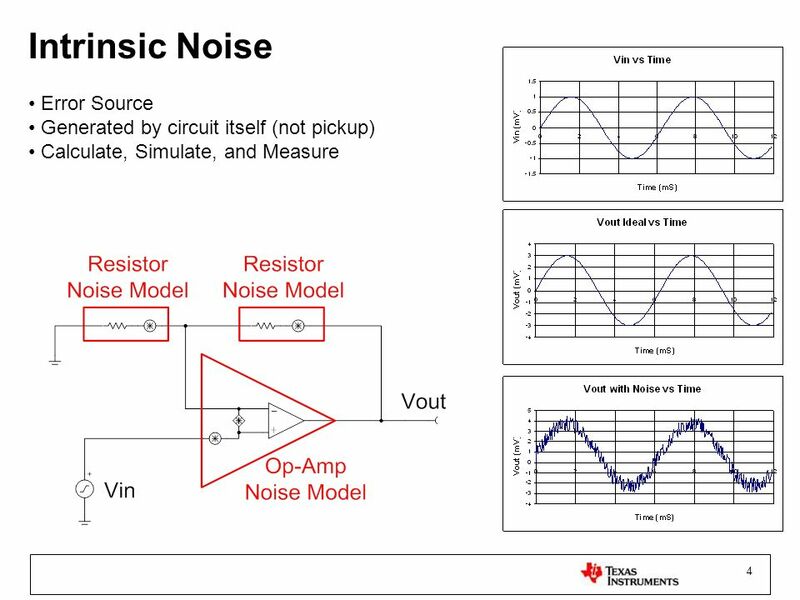 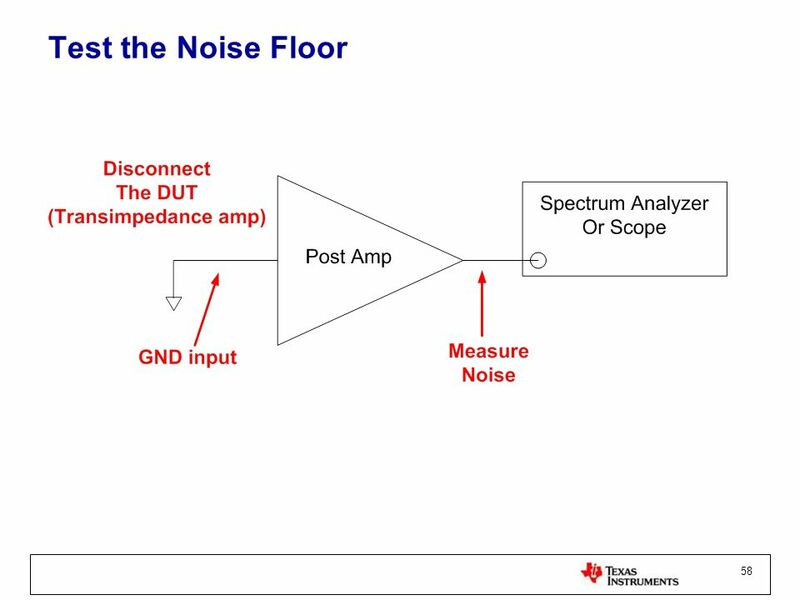 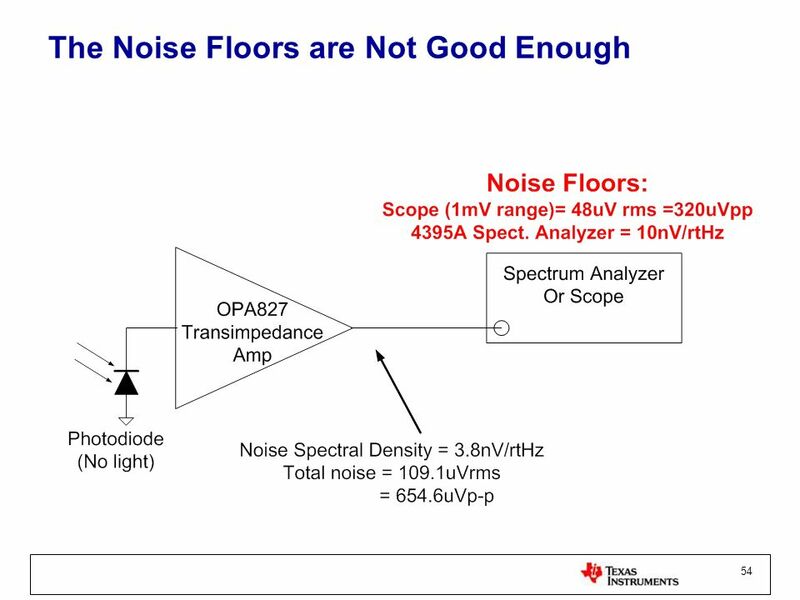 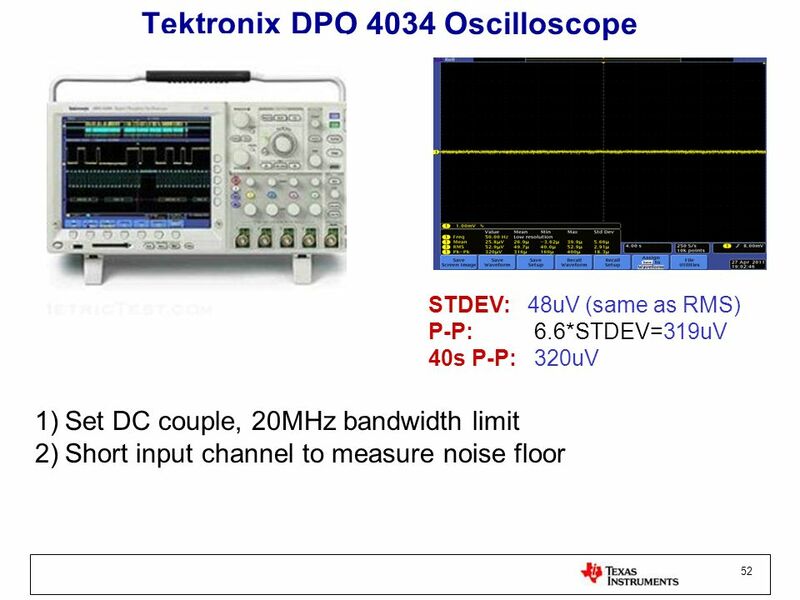 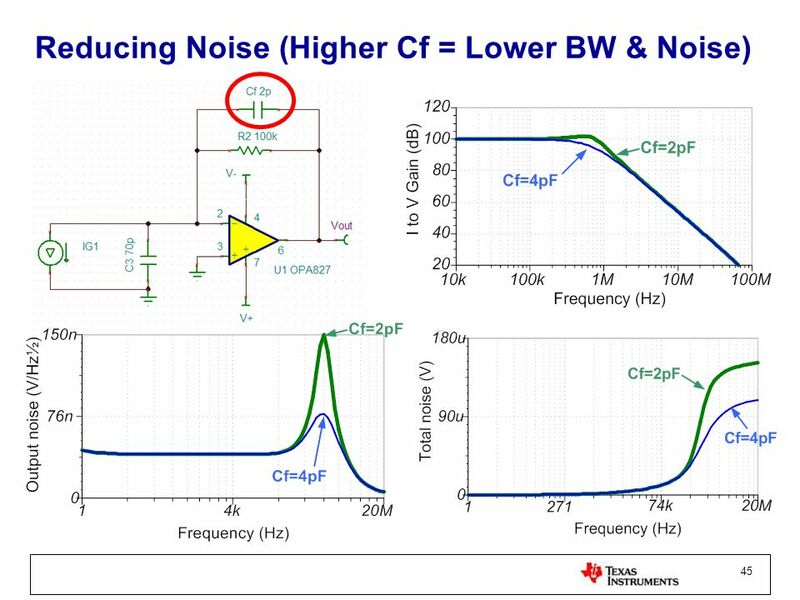 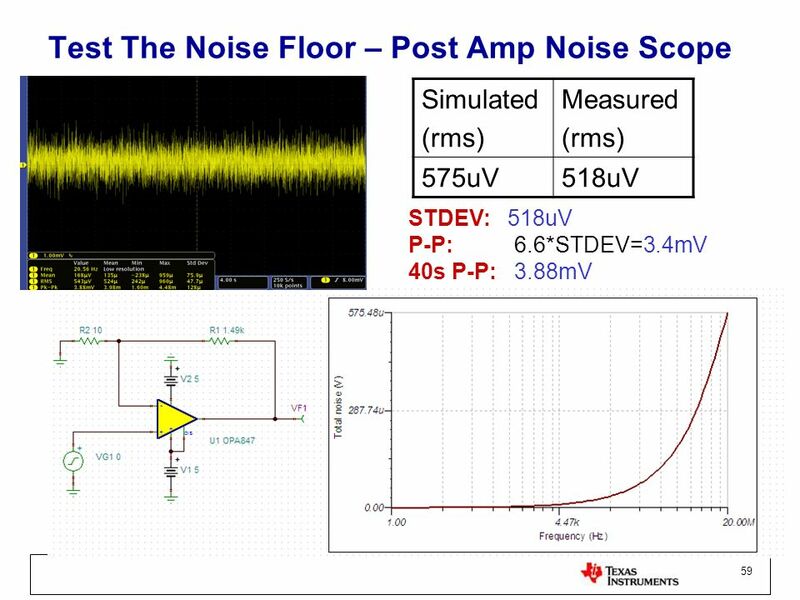 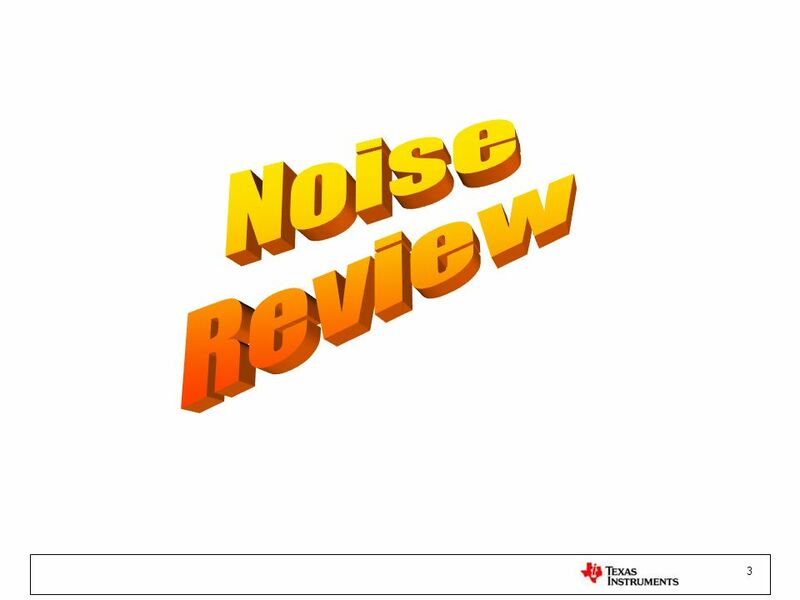 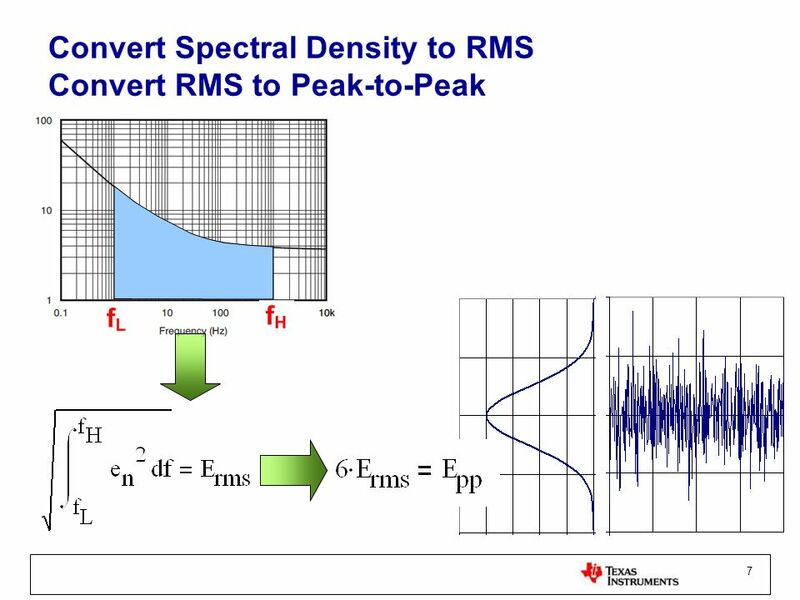 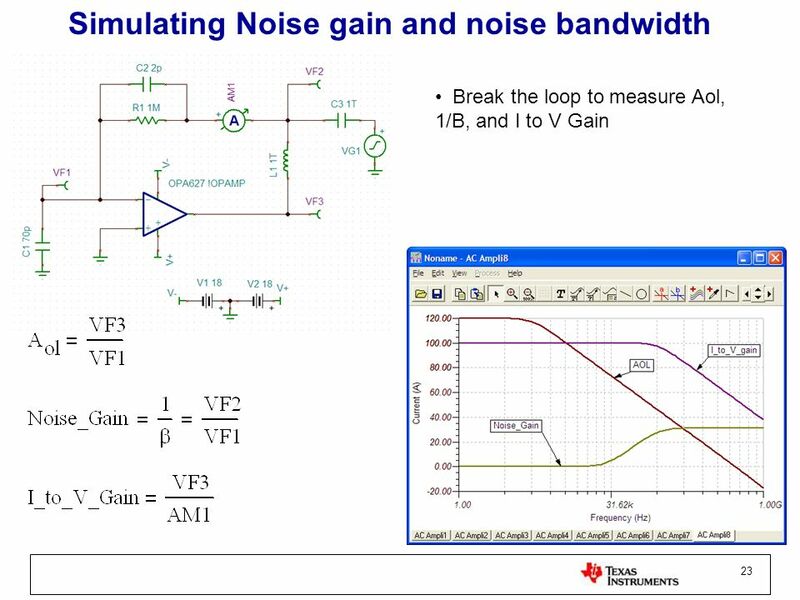 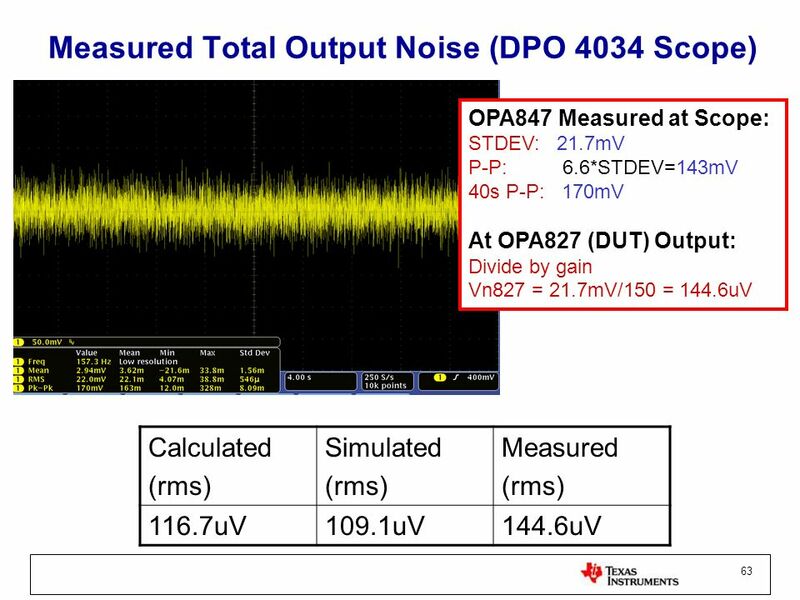 Compensation design and op amp selection is critical for noise characters. 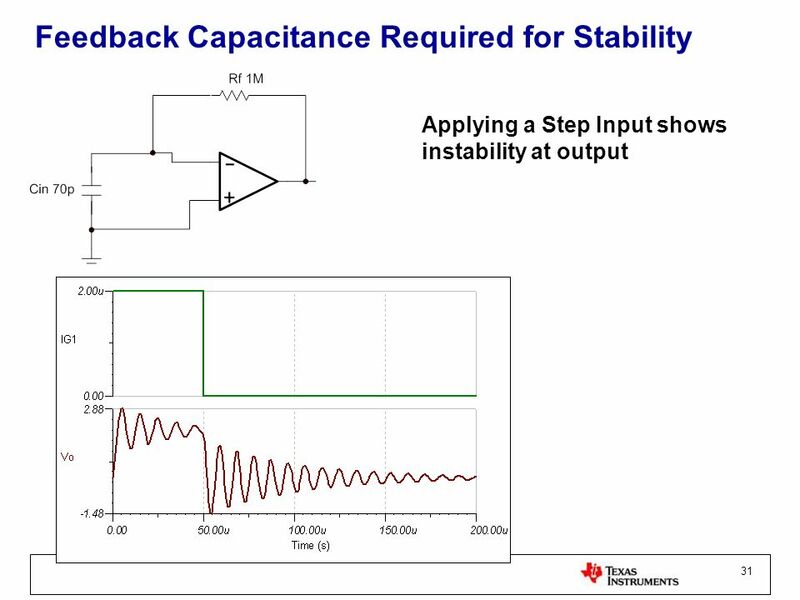 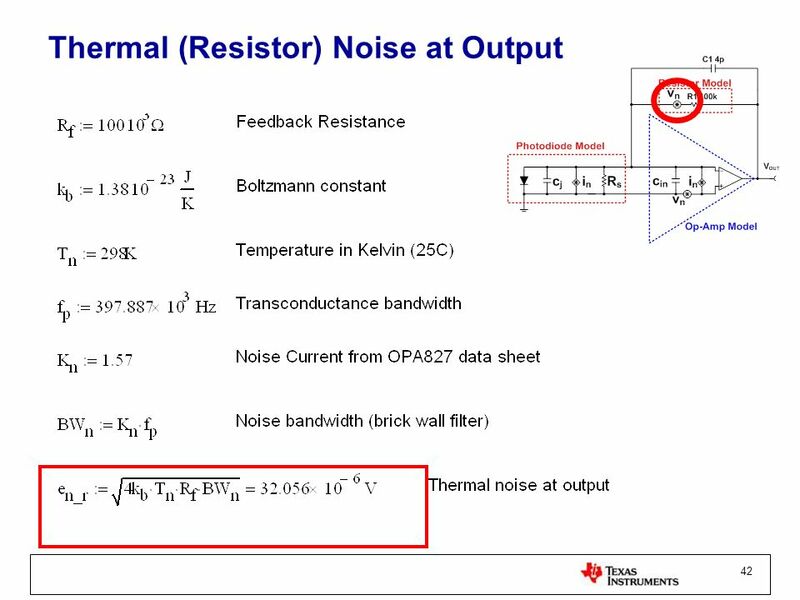 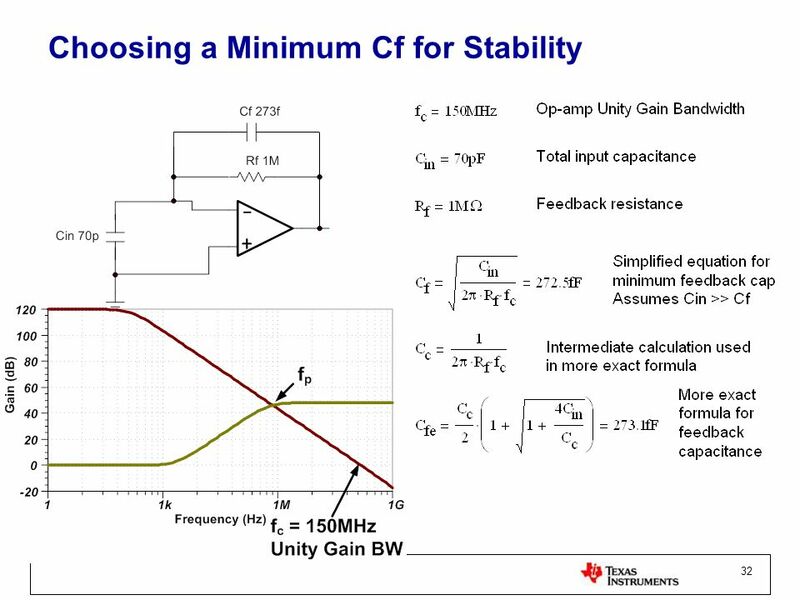 Max bandwidth with Min Cf Low Cf may be unstable Wide BW increases noise As shown Cf=Cs (stray cap) Higher feedback resistor value potentially make parasitic capacitance bypass dominate the photodiode amplifier’s response and set the circuit bandwidth. 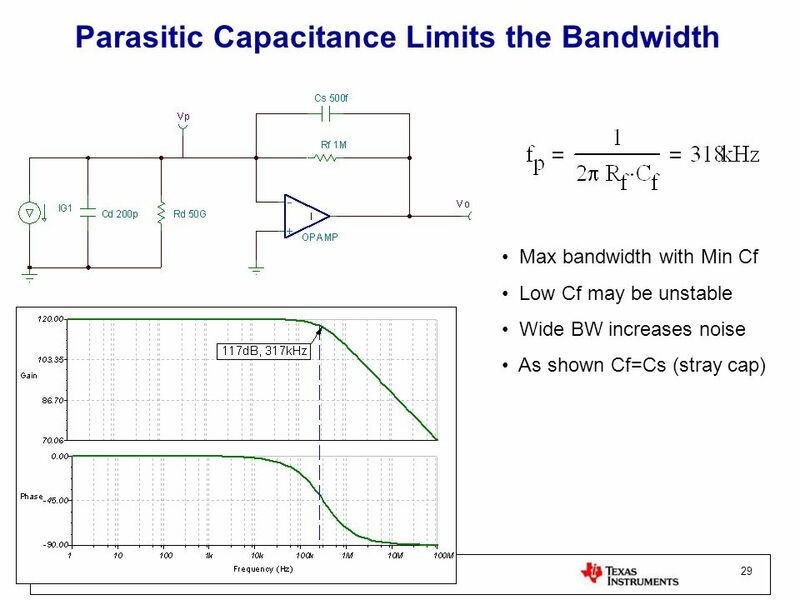 Good construction parasitic limit Cs around 0.5pF. 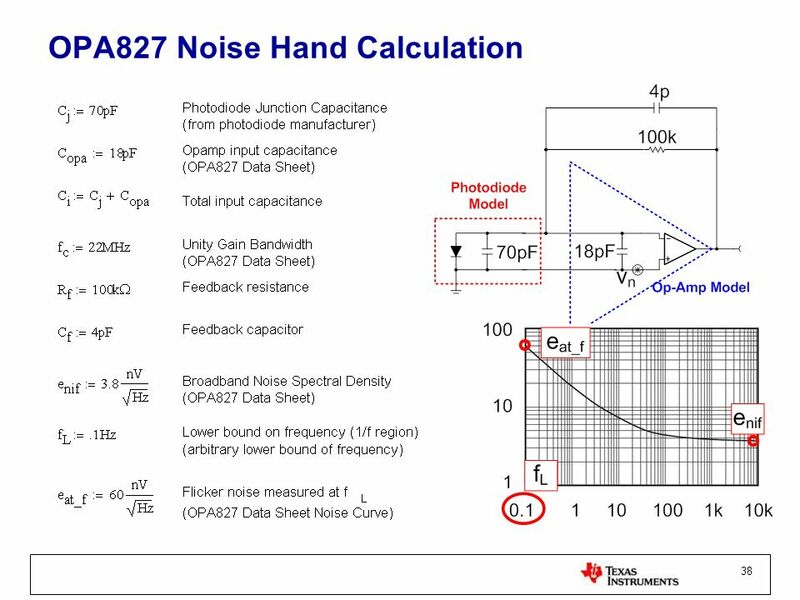 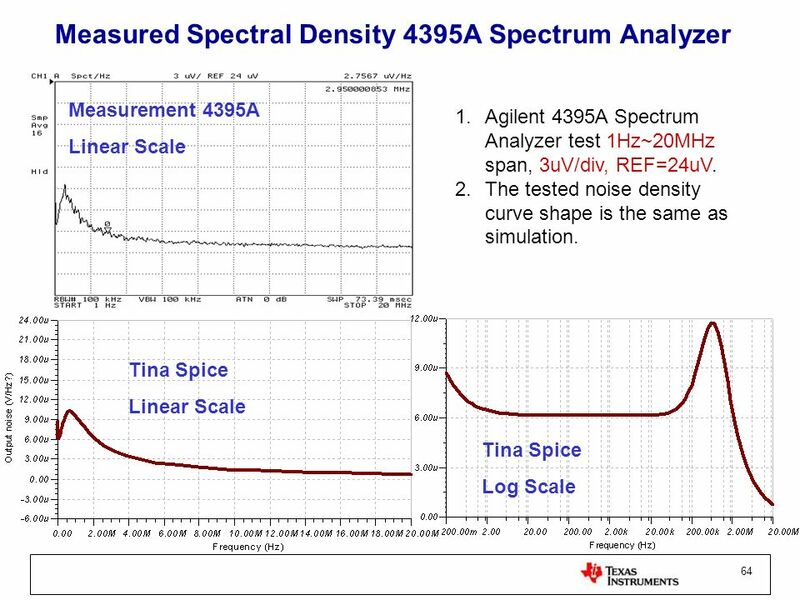 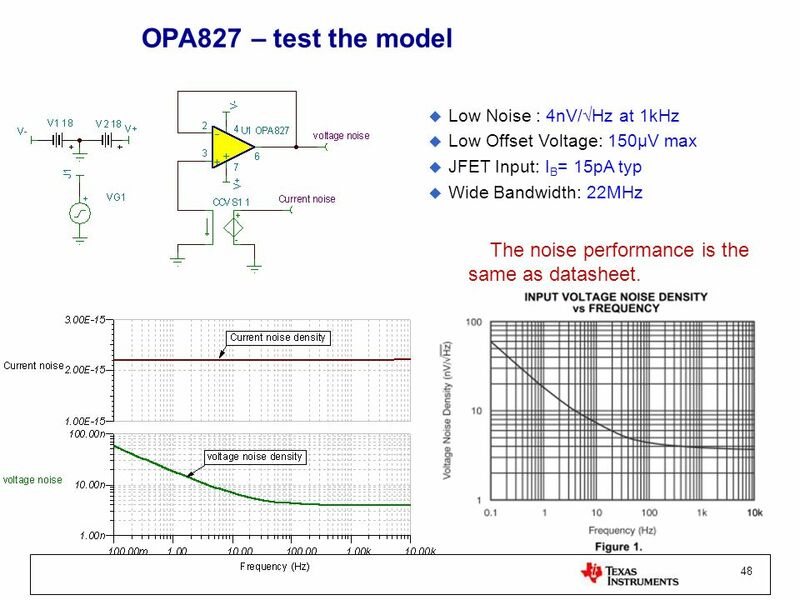 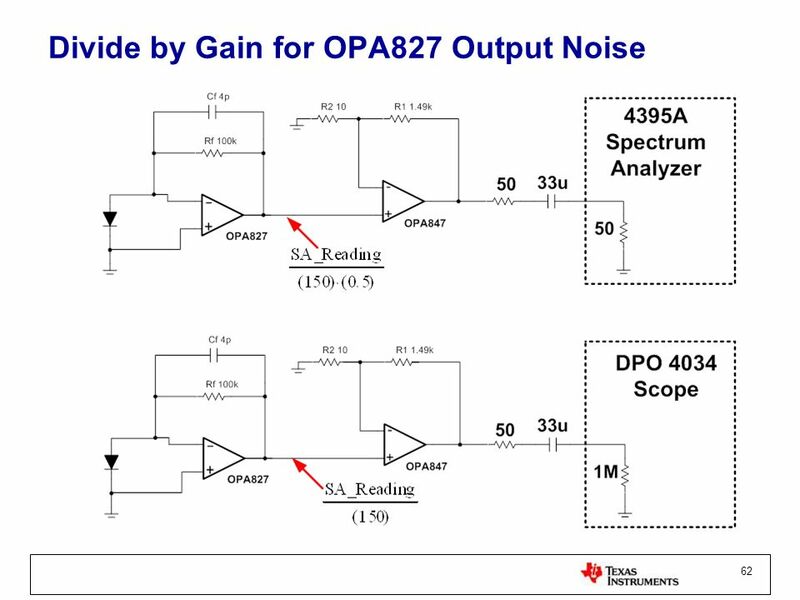 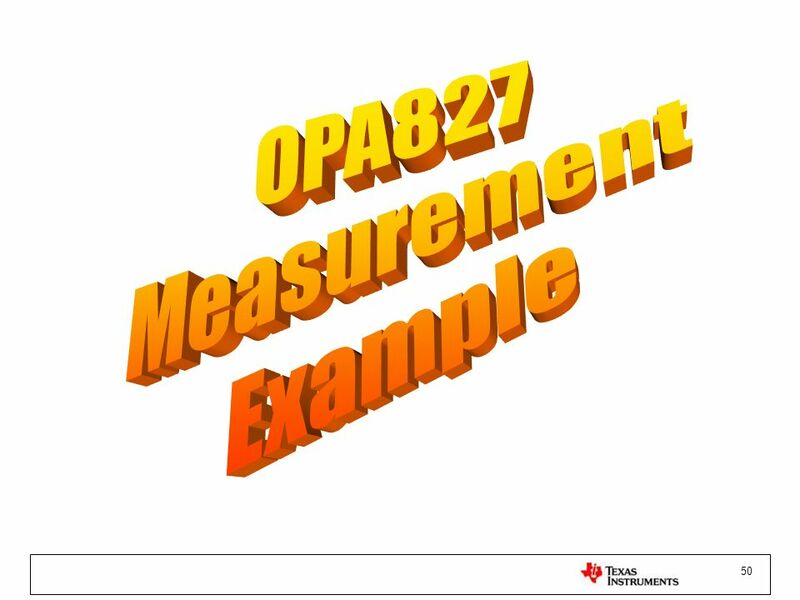 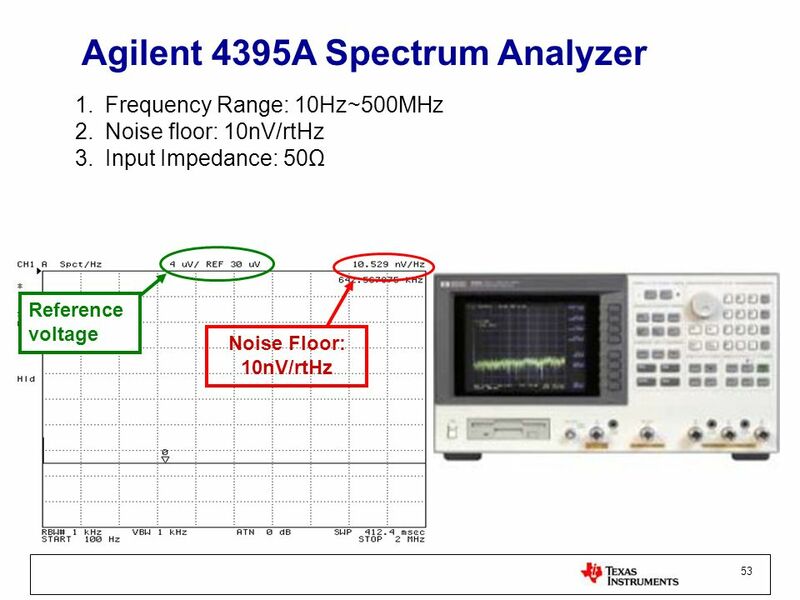 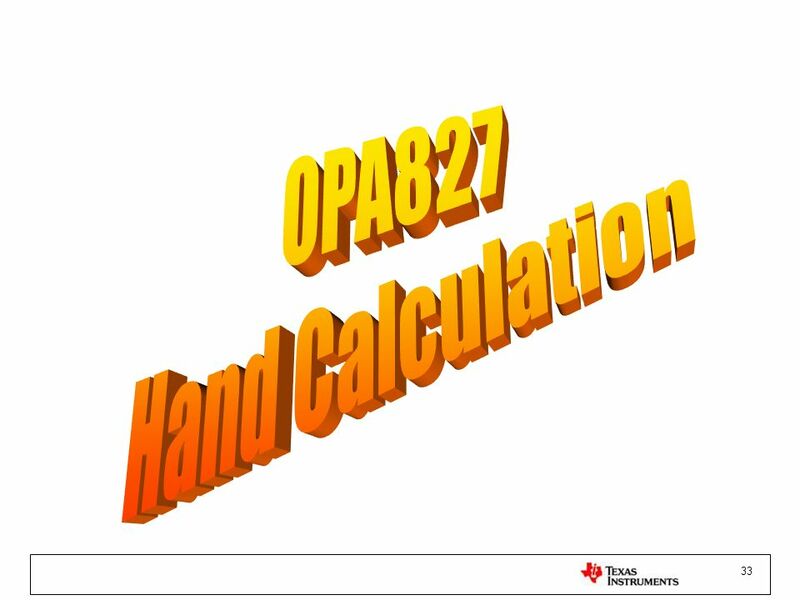 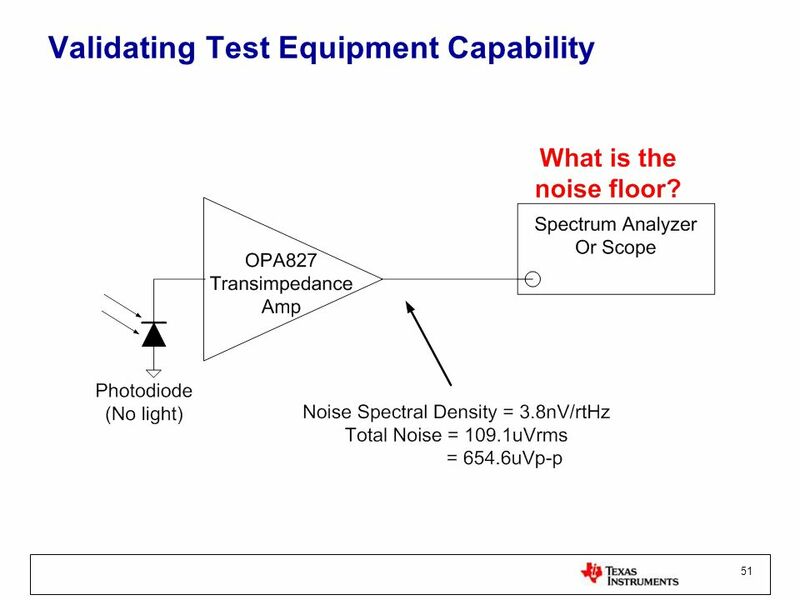 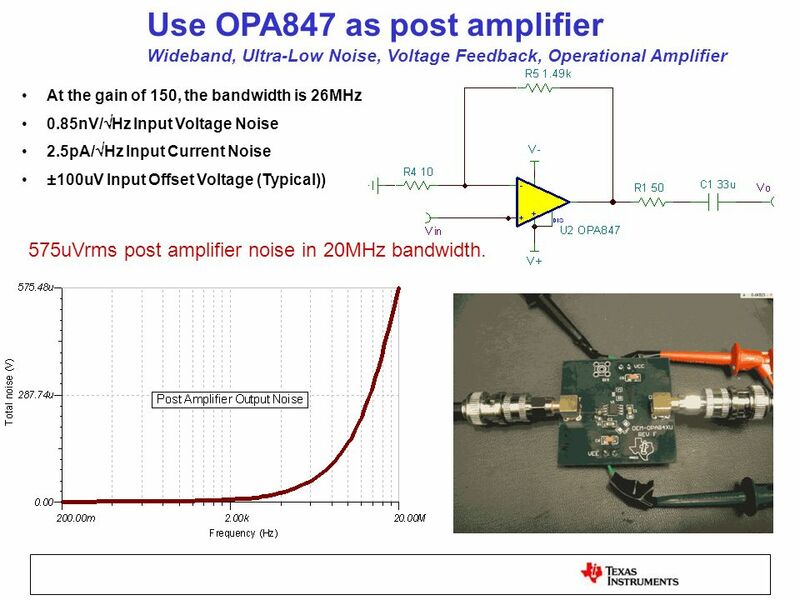 48 OPA827 – test the model Low Noise : 4nV/√Hz at 1kHz Low Offset Voltage: 150µV max JFET Input: IB= 15pA typ Wide Bandwidth: 22MHz The noise performance is the same as datasheet. 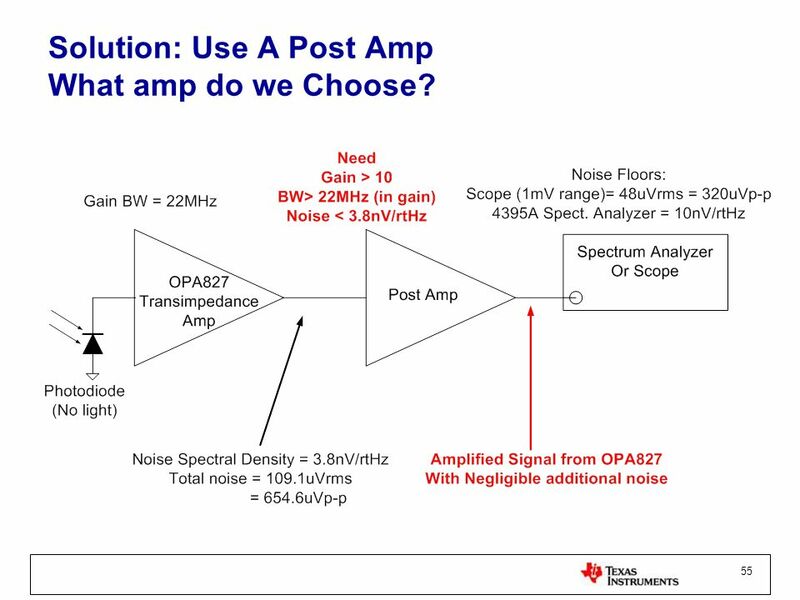 55 Solution: Use A Post Amp What amp do we Choose? 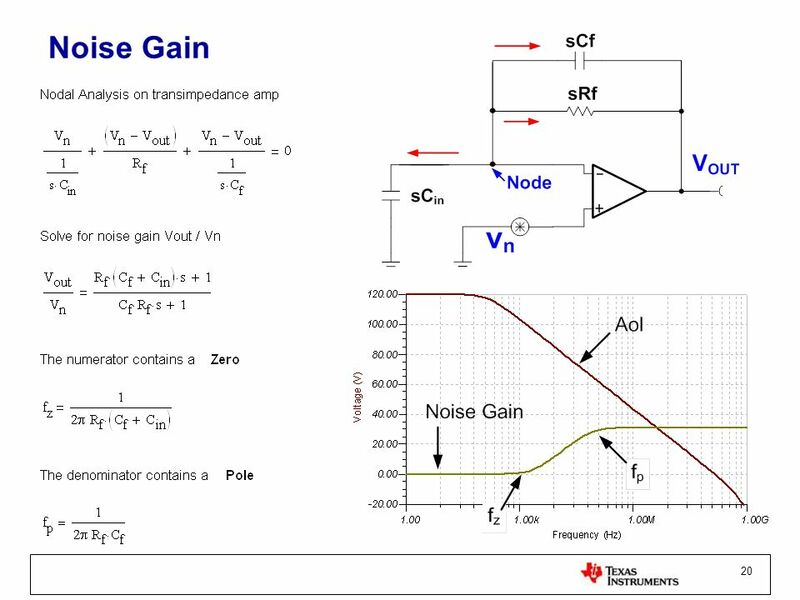 Wideband, Ultra-Low Noise, Voltage Feedback, Operational Amplifier At the gain of 150, the bandwidth is 26MHz 0.85nV/Hz Input Voltage Noise 2.5pA/Hz Input Current Noise ±100uV Input Offset Voltage (Typical)) 575uVrms post amplifier noise in 20MHz bandwidth. 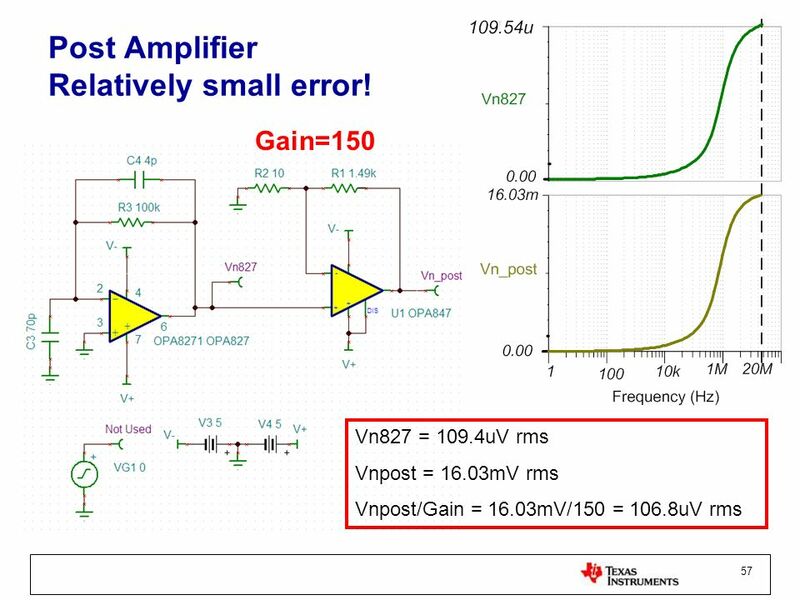 57 Post Amplifier Relatively small error! 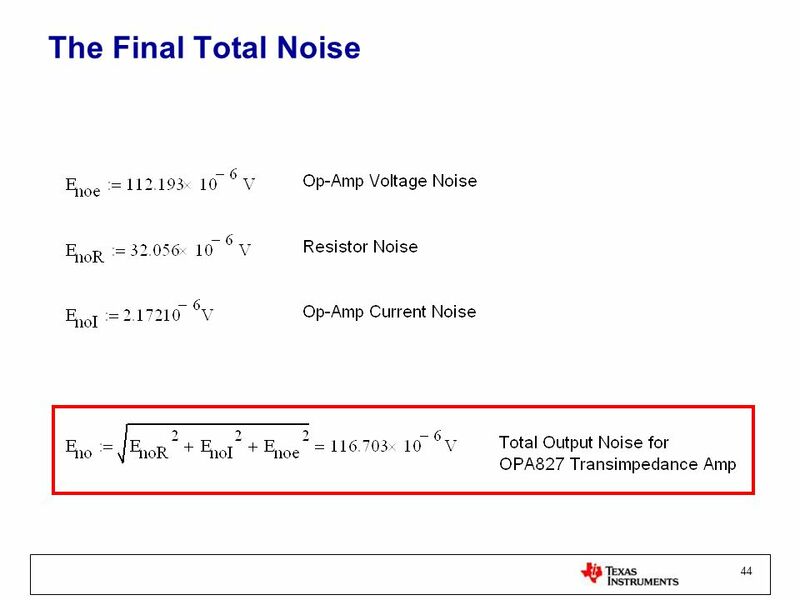 70pF junction capacitance at Vr=0 V 100dB I-V gain 4pF compensation capacitor ±5V power supply. 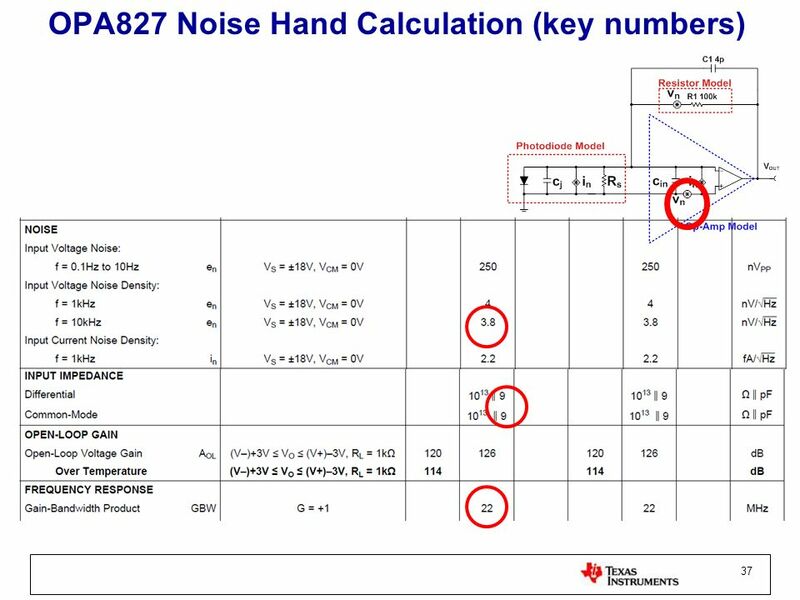 66 Before Questions, I must ask…. 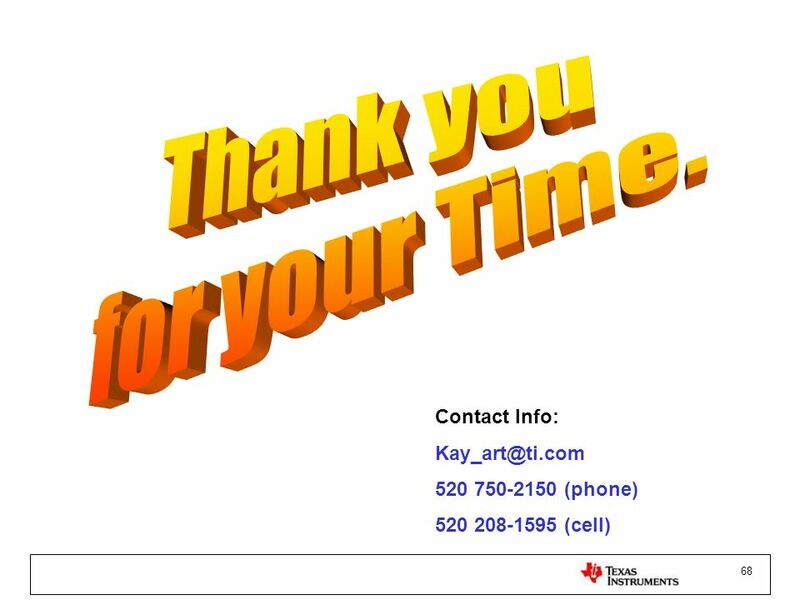 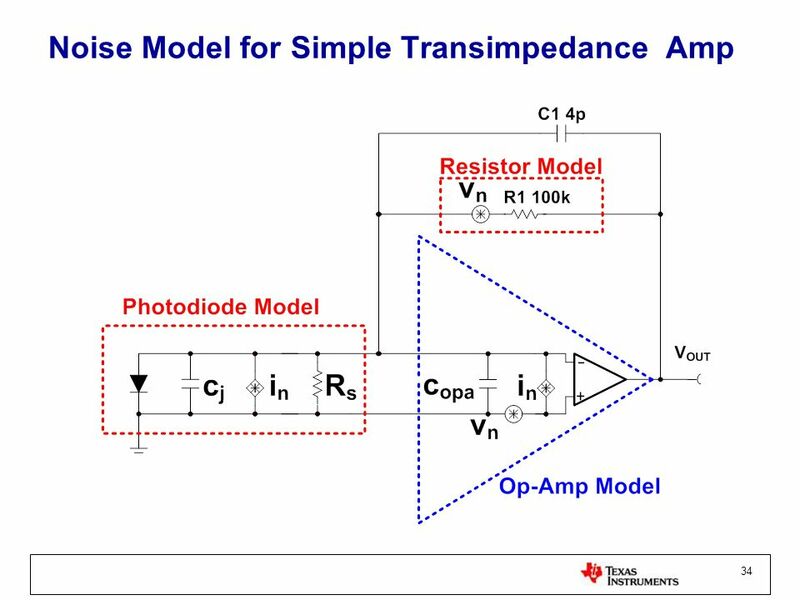 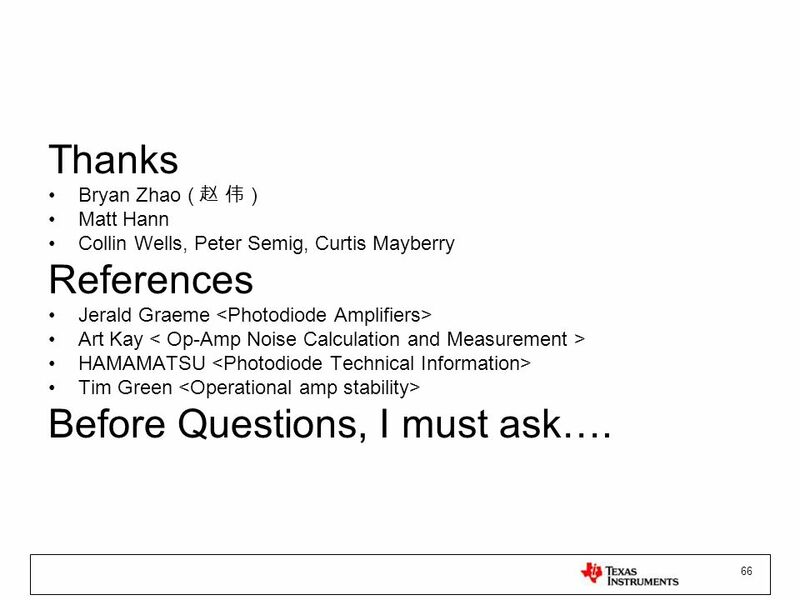 Thanks Bryan Zhao ( 赵 伟 ) Matt Hann Collin Wells, Peter Semig, Curtis Mayberry References Jerald Graeme <Photodiode Amplifiers> Art Kay < Op-Amp Noise Calculation and Measurement > HAMAMATSU <Photodiode Technical Information> Tim Green <Operational amp stability> Before Questions, I must ask…. 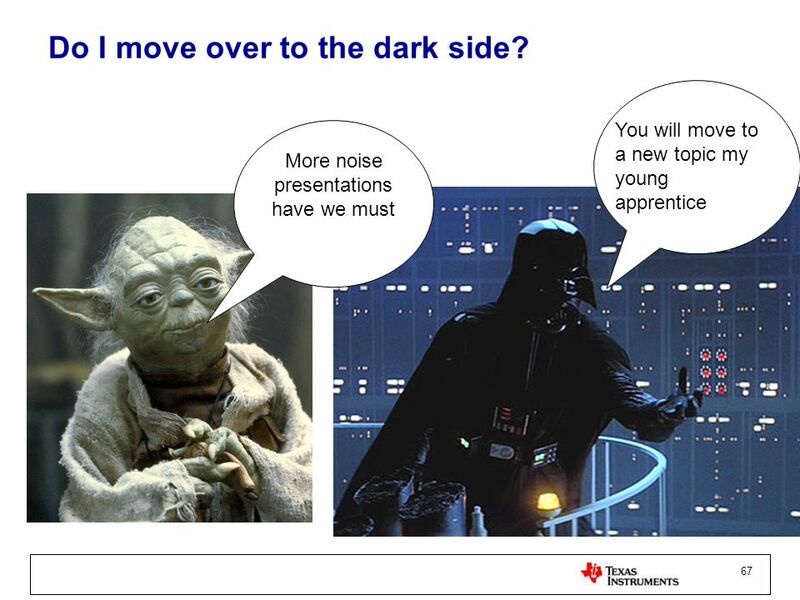 67 Do I move over to the dark side? 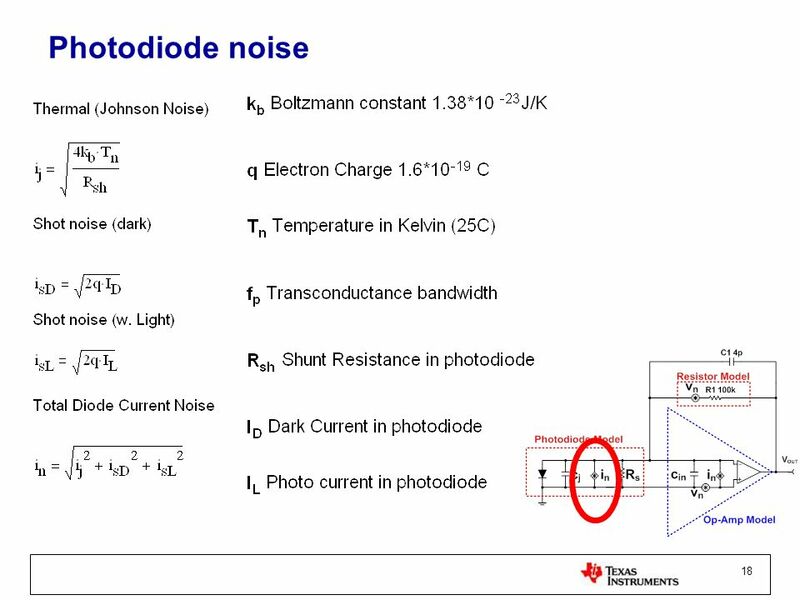 Download ppt "Noise In Photodiode Applications"
FIGURE 2.1 The purpose of linearization is to provide an output that varies linearly with some variable even if the sensor output does not. 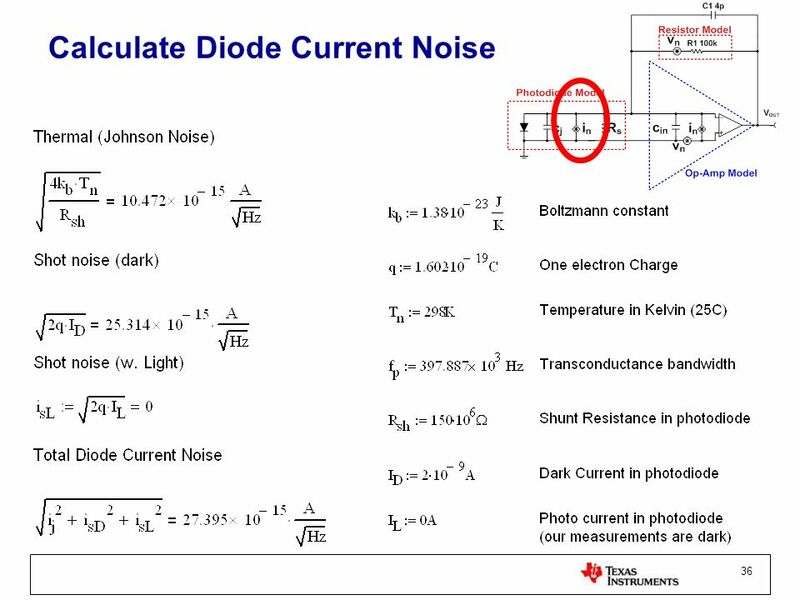 Curtis.